According to the Disabled World website, an estimated 10% of the U.S. population has what could be considered an "invisible" disease, defined as a health condition that causes significant impairment and undermines the overall quality of life but does not outwardly manifest itself in ways that are apparent to others. Chronic kidney disease (CKD) is one such invisible disease, affecting more than 661,000 Americans, according to the National Institute of Diabetes and Digestive and Kidney Diseases. As described by Paul J. Donoghue PhD, and Mary E. Siegel, PhD, in Sick and Tired of Feeling Sick and Tired: Living with Invisible Chronic Illness, a lack of external evidence, or conventional signs of suffering, can mean that those suffering from CKD may not receive a commensurate degree of compassion. This can cause those living with disease to experience self-doubt and frustration as they struggle to validate their illness and symptoms, leading to additional undesirable outcomes: anger, guilt, shame, isolation, and hopelessness. Among individuals with CKD, the implications can be dire. The Encyclopedia of Health Psychology suggests that those who do not receive support and understanding are at a higher risk for developing symptoms of depression; Hedayati et al indicate in Kidney International that those with depression are twice as likely to be rehospitalized and/or die. 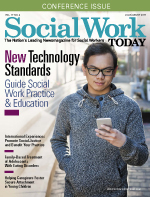 Social workers are instrumental in addressing these challenges by validating the patient's experiences, helping them prioritize the support they require and providing the tools they need to communicate those needs. Through education to the patient and their support network, social workers can promote quality of life and address symptoms of depression and anxiety to protect the patient's sense of self and cultivate a healthy mindset. Comments such as "You don't look sick," while often intended as encouragement or a compliment, can carry unintended consequences. If they don't "look sick," the reasoning goes, it must not be so; yet, they struggle with the realities of their condition. This can lead to a questioning of the validity of symptoms and feelings of inadequacy as individuals wonder whether they are overreacting or trying hard enough to manage their disease. The incongruence between the seriousness of the illness and the absence of visible suffering is difficult for many people to rectify. Comments such as these are often a greater reflection on the person who said them as they attempt to grapple with their own sense of helplessness. Those suffering from invisible disease must avoid letting a comment such as "You don't look sick" diminish their daily struggles and/or victories. When someone with an invisible disease such as CKD says they are struggling with symptoms, believe them. Make no mistake, the effects are real, and despite efforts to manage the disease, symptoms will wax and wane. The manifestation of symptoms and level of impairment differs from person to person, and the trajectory is rarely linear. In its early stages, CKD often has limited to no outward signs, yet its considerable effects can dramatically alter the day-to-day lives of those with the disease. A morning fraught with pain and severe fatigue may be followed by an afternoon with energy and improved focus, only to be followed by an evening trip to the emergency department. The inconsistent and unreliable nature of CKD symptoms can cause confusion for observers, as they do not fit neatly into the schema of what a "sick person" should look like. Overcoming symptoms is not a simple case of mind over matter. For those who experience chronic pain, the degree of this pain is so different from transient aches and pains that language is inadequate for the task of describing it. It appears regardless of activity or inactivity, happiness or sadness. It simply exists in and of itself; no medication, positive thought, or rest can relieve it. In addition to disturbing, agonizing, and even disabling symptoms, the person with an invisible disease suffers, often deeply, from the negative reactions of others. In addition to the symptoms of a disease such as CKD, undertaking treatment is life changing. Individuals who require dialysis must commit to treatment three to seven days a week, averaging three to four hours each. Dialysis treatment also requires transitioning to a renal diet, limiting fluids to 1.5 to 2 L per day, a medication regimen, and a host of medical appointments. This does not account for other challenges such as infection, cardiac complications, problems with access (i.e., catheter or fistula), or simply managing daily activities such as work and family. Individuals must evaluate the nature of the relationship and what support, if any, one can garner from it before undertaking any conversations about the disease and their corresponding needs. Not everyone will be worthy of time and emotional energy. For relationships that merit the investment, individuals must consider what support those relationships can and are willing to offer. • whether this person wants to gain a better perspective on how they feel and what they need. Individuals must seriously consider whether this person's understanding of the disease can contribute to their physical and emotional well-being before engaging them. If not, their energy may be better spent on other relationships, symptom management, and efforts to improve quality of life. Individuals must develop a plan for engaging someone about their needs before initiating the conversation. Attempts to share all aspects of the disease with everyone can be overwhelming for all parties. Social workers must help narrow the focus of these conversations by deciphering which symptoms and issues are relevant to each relationship. Close and ongoing relationships may benefit from a more extensive dialogue, whereas conversations with an employer may focus only on certain aspects of the disease and the symptoms that specifically impact that dynamic. For example, sharing certain facts with their boss may promote understanding of their need to alter work schedules to accommodate dialysis or shifting duties to comply with doctor's orders. A conversation with their spouse about issues such as fatigue, financial struggles, and/or loss of sexual interest, will look very different. Socials workers can be integral in developing strategies for addressing sensitive topics and emotionally charged issues, minimizing the inherent stress and preventing negative outcomes. For those with CKD and similar invisible diseases, maintaining a positive outlook and pursuing goals can be difficult. Social workers must never forget that quality of life is just as important as treatment compliance, accessing benefits, and managing mental health symptoms. Possessing such qualities is key to protecting one's sense of self and warding off feelings of hurt, isolation, and hopelessness. An individual's sense of purpose in the face of disease is unique and measured by those aspects of life that hold special significance to them, including family, friends, career, hobbies, and/or spirituality. In its absence, a significant void can exist. For some, identifying a sense of purpose can be challenging. For others, the limitations imposed by the disease and co-occurring conditions may make fulfilling goals more difficult. In either case, social workers can help individuals reinvent themselves by embracing new opportunities that better align with their current circumstances. For example, if a love of reading has been affected by diminished eyesight due to glaucoma, then suggest audio books. If exercise is important to the individual but physical limitations prevent engagement in their preferred activity, encourage them to talk with their doctor and/or a personal trainer who can help adapt a new workout. If the loss of loved ones or limited mobility has hindered their social interactions, introduce new outlets through their faith community, neighborhood, community center, or other local resources. For disenfranchised individuals with limited resources, social workers need to expand their focus on securing benefits to include quality of life considerations. Accessing resources can make a significant difference by minimizing stressors and freeing time and energy that can be devoted to pursuits, goals, and the development of purpose. If individuals struggle to identify what they love and find fulfilling, encourage them to talk with a family member, friend, neighbor, someone in their faith community, or a mental health professional to brainstorm ideas that may elude them on their own. • remain focused on a self-identified and meaningful purpose. Though individuals can feel their disease is a part of them, they must not allow it to define who they are. Help them accept their new circumstances, minimize the symptoms they can, and pursue goals that provide a real sense of purpose to combat the moments when they feel vulnerable. According to Toni Bernhard, JD, who is published on the subject of chronic pain and illness, "The kindest thing we can do for ourselves when people disappoint us is to accept that disappointments are an inevitable part of life and then cultivate compassion for ourselves over any suffering we're experiencing as a result of [others'] lack of understanding about what it's like to live with invisible pain and with invisible illness." Empowered with this mindset, individuals will be in a better place to confront statements such as "You don't look sick" by thanking the person for saying so and encouraging them, next time, to comment, "You look good. How are you feeling?" — Christen Perry, LCSW, is a social worker for Satellite Healthcare.